The glorious global oligarchy tragically lost one of its staunchest supporters in the autumn of 2015, when the esteemed David Rockefeller perished in a sudden explosion while re-reading his autobiographical Memoirs for the 99th time by the lily pond of his Mumbai estate. The cause of the explosion remains a mystery to this day, but is believed by many experts to be the result of a spontaneous combustion of hubris. Anxious to preserve what was left of Mr. Rockefeller’s peculiar visage for posterity and potential profit, Rockefeller heirs scraped up his scattered remains and stored them in the family cryogenic tomb for future cloning. Unfortunately, the venerable Rockefeller scraps had been contaminated with pond scum in the preservation process, severely limiting their market value. They were eventually sold for $50 at a family remains clearance sale to Immortal Remains, Inc., an up-and-coming traveling freak show specializing in elite oddities from around the globe. 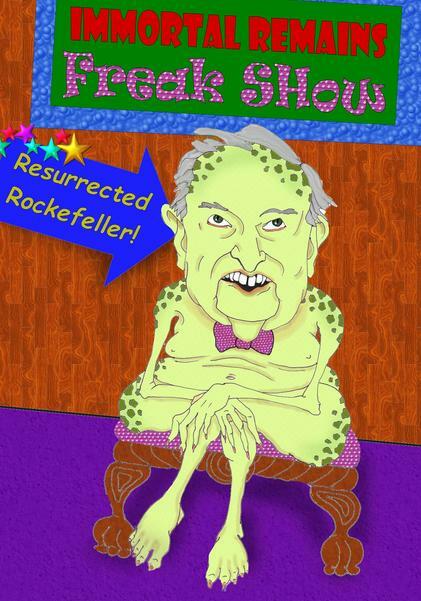 With an intrepid entrepreneurial spirit and an investment of only $1200, Immortal Remains created the Resurrected Rockefeller Exhibit, featuring a slightly irregular Rockefeller manufactured by Poughkeepsie Discount Clones. It has proven to be one of the most popular attractions, drawing tens of thousands each year as a favorite target for the International Cherry Pit Spit championships. Now, read the full interview (short) at David Rockefeller Speaks on the Divine Right of Kings.